So - typically about mid-July we start having discussions around the dinner table recapping all of our memorable ski trips of the prior winter. Its typically 95 degrees out and summer is in full swing but often the conversation around our house turns back to skiing. So why do we do this? Why do we drag ourselves out of the house at 6AM (a post on the logistics of a 6AM departure upcoming) to ski? It is too build memories as a family. My wife and I had our earliest dates on a ski mountain (hey - that's a future blog post!) and now it is great to share the outdoors with our boys. So that brings us to what I think was our best ever ski day. It was two years ago over New Years - 2009. We managed to rent a condo in-town Rangeley to visit our favorite mountain Saddleback over the New Years holiday. We won season passes for the entire family in a video contest (I'll be blogging about that!) so we were taking advantage. Being an avid ski family means fanatically checking the long range weather forecasts (another blog post idea!). It looked like a monster snow storm had a shot of hitting us, so I extended our trip by a day. The first two days were very nice. 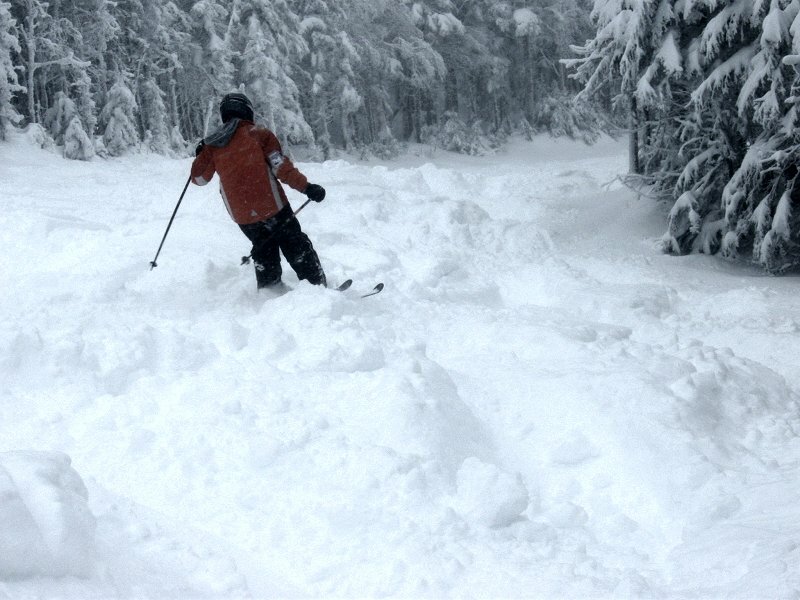 A few inches of snow made the skiing fresh and fun. Then the evening of January 2nd, channel 8 news was going overboard on the hype-o-nator about the end of the world snowstorm coming to Maine. You always have to take Channel 8 "STORM-TEAM" with a grain of salt but this did look like a good one. It nuked snow all night and I could barely sleep. I kept checking outside like a kid waiting for Santa. Finally morning came and we had to dig ourselves out of the condo to get to the car. The drive up to the base lodge we could tell the drifts were getting deeper and deeper. About 3 feet of snow greeted us as we unloaded the skis and gear. All the powder-hound skiers were there (a devoted group they are) but it was snowing so hard that most people could not venture the roads so the ski-crowd were light. We took our first run down Golden Smelt. It was nutty deep. We passed a guy at the top of this trail looking for his ski that he lost in the deep snow. We gave him a sympathetic shrug but we passed by as there was snow to shred. Juley, my wife, popped over the head wall on this trail and took a tumble - but landed in a pile of fluff and was buried. I had to climb back up the trail to help her dig out. All day was like this. It was one deep snow trail after another. 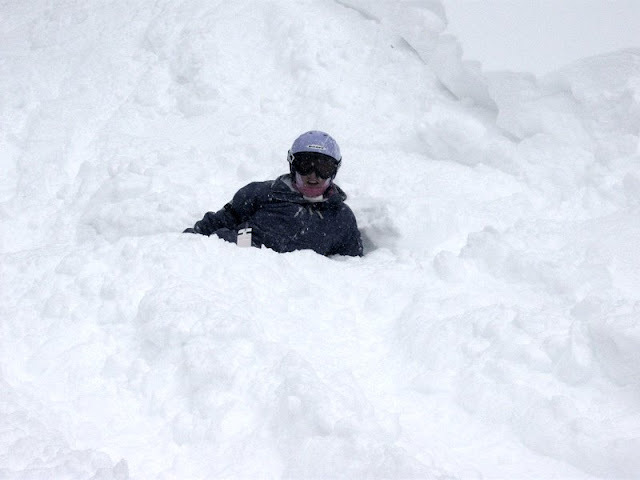 We fell and laughed and fell again and just kept finding more and more and more snow. 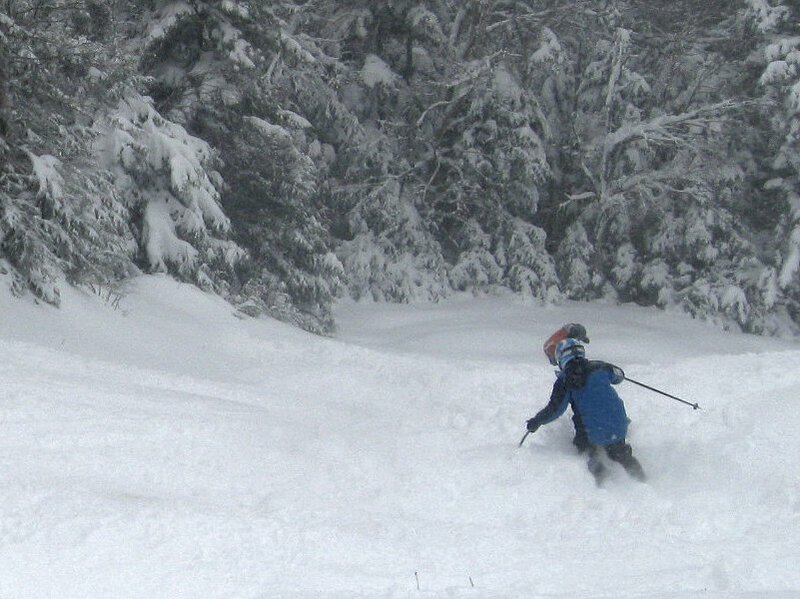 We have had some very stellar ski days since then, but nothing quite like this. When I look back at my childhood, I don't remember the homework I did or the tests I took or the chores I did. While they were all important in building good work habits and character... the things that make me smile where the fun adventures that I had with my parents. This will be one of those days that I will be talking about when I am an old geezer in the rocking chair telling stories to my great-grandchildren... hopefully my rocking chair will be overlooking a mountain.